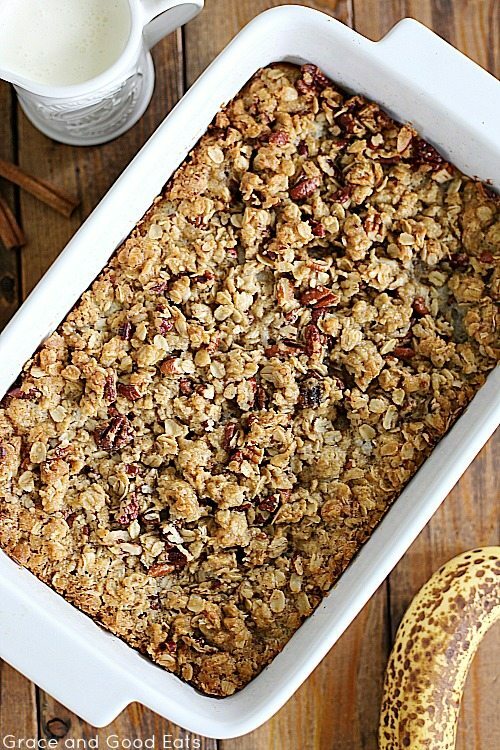 All the delicious tastes of banana bread in a gooey, warm cobbler that is perfect for breakfast or dessert. Serve this Banana Bread Cobbler with a drizzle of fresh cream or a scoop of vanilla ice cream. It’s no secret that I am a fairly picky eater- especially when it comes to fruits and vegetables. I love apples (after my husband introduced me to honeycrisps- yum), will tolerate stone fruit like peaches and cherries when baked in desserts (pies, turnovers, cobblers, etc), but despise berries like blackberries, raspberries, and blueberries. I can’t even handle them blended up in my smoothies because of the tiny little seeds. Of all the fruits, though, bananas are my favorite. I have one kiddo that loves them as much as I do and another that can’t even stand the smell of them in the house. I love them plain, with peanut butter, in banana bread, and definitely in this Banana Bread Cobbler. 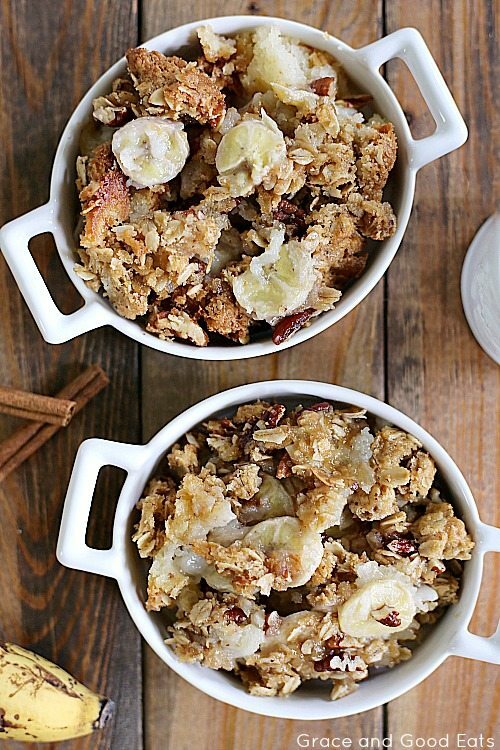 It’s all the delicious tastes of banana bread in a gooey, warm cobbler that is perfectly acceptable for breakfast or dessert. We seem to eat through bananas in spurts around my house. One week I will buy a bunch and they won’t last us three days, the next week I will buy them, forget about them, and then frantically try to make banana bread or chocolate chip banana bread muffins before they turn to brown mush before my eyes. We like our bananas completely yellow with brown freckles just starting to make their appearance. Not at all firm, not mushy soft, just the slightest bite. I don’t know how you monsters misguided people eat green bananas. My husband eats them sliced on top of his cereal but I can’t get onboard with that banana nonsense either. The varying textures + cold, wet milk is just too much for me. If you find yourself with a bunch of brown bananas you need to use quickly you can always freeze them for smoothies. I can never seem to remember to do that for some reason… maybe because I love banana bread more than smoothies. This Banana Bread Cobbler is my new love though. Serve it warm with a drizzle of fresh cream for breakfast or top it with a big scoop of vanilla ice cream also for breakfast for dessert. 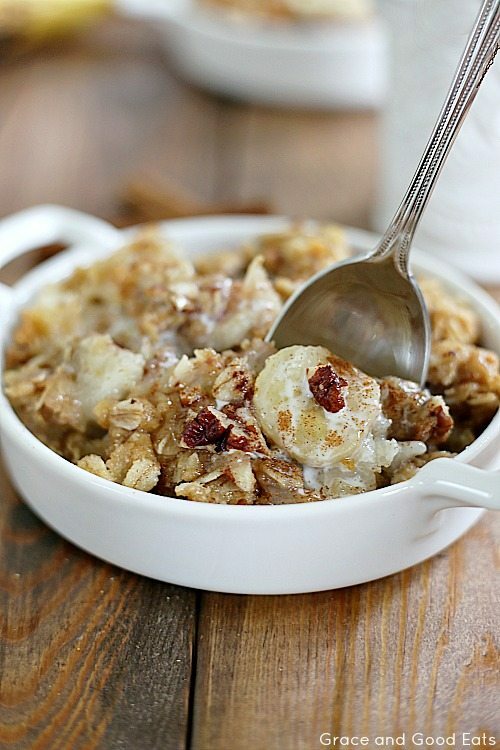 All the tastes of banana bread in a gooey, warm cobbler that is perfect for breakfast or dessert. 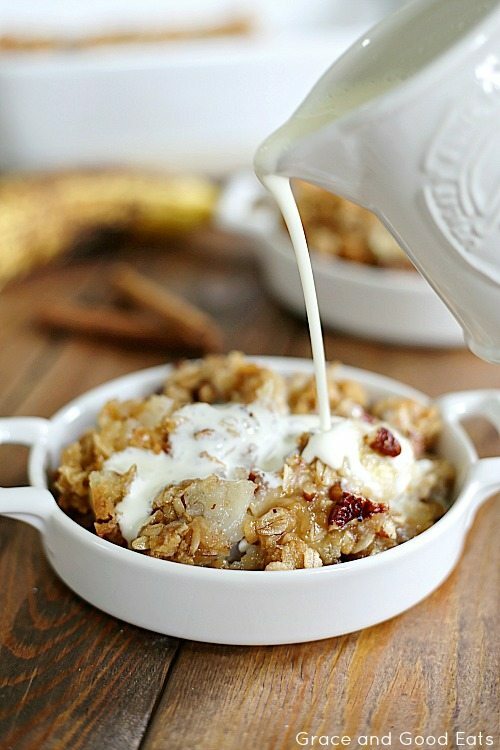 Serve this Banana Bread Cobbler with a drizzle of fresh cream or a scoop of vanilla ice cream. Preheat oven to 375 F. Lightly grease an 11x7 dish; set aside. 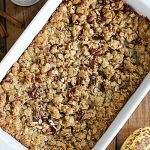 To prepare the streusel topping: use a fork to stir together brown sugar, flour, and butter until crumbly. 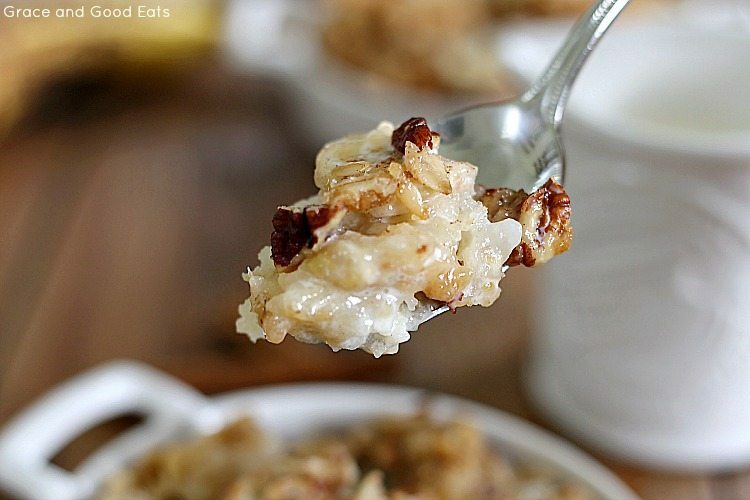 Stir in oats and pecans; set aside. Whisk together flour, sugar, and milk until just blended; whisk in melted butter. Pour cobbler mixture into prepared baking dish. 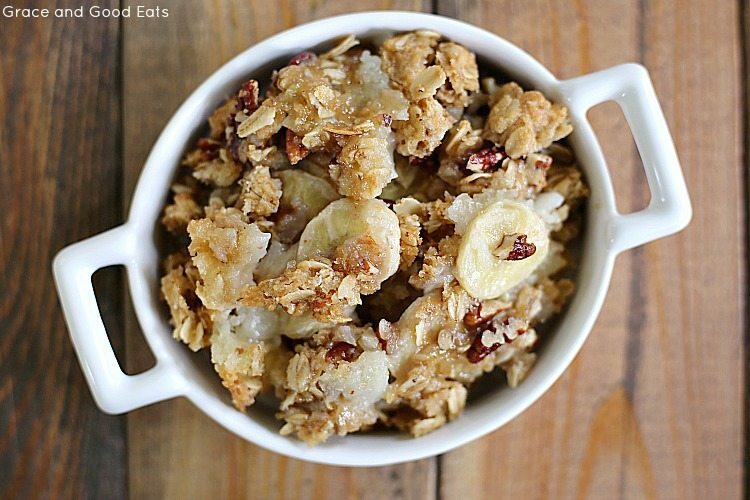 Top with banana slices and sprinkle with streusel topping. Bake at 375 degrees for 40-45 minutes or until golden brown and bubbly.